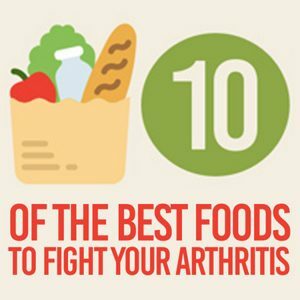 There are many different types of food that people with arthritis are recommended to stay away from. Red meat, fried food and alcohol are not only bad for your general health but have also been linked to an increase in inflammation. Below is an infographic that shows foods that are not only good for you but could help to breakdown inflammatory problems associated with rheumatoid arthritis. Embed this infographic on your site with this code! Allium vegetables such as garlic contain enzymes that slow the progression of the arthritis. Adding oily fish such as sardines, salmon and tuna that are packed with omega-3 fatty acids to your diet twice a week will help to fight inflammation. Calcium loaded broccoli helps reduce destruction of cartilage joints. It helps to block the enzymes associated with joint damage. Almonds are a great source of protein and antioxidants that help combat fatigue which is a common symptom of RA. Loaded with beta-carotene which have been proven to reduce symptoms of inflammation in the body. The active ingredient in turmeric is curcumin helps regulate the body’s immune response to inflammation. Ginger in its concentrated form has been shown to decrease the inflammatory reaction in cells affected by RA. High in vitamin C, can help ward off free radicals which are molecules that promote inflammation. Containing antioxidants protect cells from free radicals and lower nitric oxide which has been linked to RA. These healthy tips has been provided by Luigi Perri (Head of Marketing Foodora). Foodora is one of the best thai food delivery chain in Australia.